Our company was started with a singular mission, to eliminate the carbon fiber waste coming out of the commercial aerospace and space flight industries. Over 10 million pounds of carbon fiber waste and scrap was produced last year. Some of it is incinerated but the majority is sent to the landfill. As we mention on our Materials page, this stuff is designed to survive the harsh conditions of space travel, which means it is not biodegradable, it will sit in the landfills and continue to pile up. With more, and larger, planes and rockets being built, this problem will only get worse. Our Founder, Ryan Olliges, identified this issue while studying Aerospace Engineering at the University of Southern California (USC), and he decided to do something about it. With the help of Greg Autry, a well-connected space industry researcher and professor of entrepreneurship at USC, they launched 121C Inc. The goal of 121C was to show that this waste material could be "upcycled" into strong and durable products. This resulted in the creation of 121C Boards, a line of 100% carbon fiber skate decks. 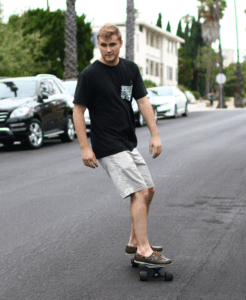 With three successful Kickstarter campaigns and over 2000 boards sold, they knew there was a market for high quality, environmentally friendly, carbon fiber products. Over the last few years 121C has been approached by various companies to help them make parts out of carbon fiber. We saw this as an opportunity to grow the business beyond skateboards. It would also allow us to collect, and use, more of the waste carbon fiber that is being sent to the landfill. We decided to create a new brand to focus on these new markets, that is how Elevated Materials was born. While we offer many products and services, our mission remains the same, to eliminate carbon fiber waste. Since we started we have diverted close to 200,000 pounds of waste material, and we aren't stopping any time soon. So join us on this mission of achieving Zero Waste today. Ryan is an Aerospace Engineering graduate from the University of Southern California. While working in the Rocket Propulsion Lab he realized how much unused carbon fiber is sent to the landfill during the manufacture of rockets and spacecraft. As someone who loves the outdoors and the environment, Ryan immediately set about finding a solution to this problem. Greg is an Assistant Professor of Clinical Entrepreneurship at the University of Southern California. He is a researcher on space entrepreneurship, commercial space economics and space policy, and served as White House liaison with NASA. Greg is also a serial entrepreneur and is active in supporting American manufacturing. Jaysen has many years of entrepreneurial experience in several startups. He is experienced in implementation systems throughout organizations large and small, including several major projects in the IT Field. Jaysen is also experienced in web, ecommerce and app development. Adrian is an adjunct professor at the Marshall School of Business at USC. He is a founding partner of the firm Clumeck, Stern, Schenkelberg & Getzoff, a certified Forensic Accountant and Chairman of the California Center for Public Health Advocacy.